Enormous gold mines, original miners' huts of the 1850s, heritage gardens, unique wineries, wildlife parks, museums, art galleries and markets showcase the charm and diversity of the central Goldfields region. 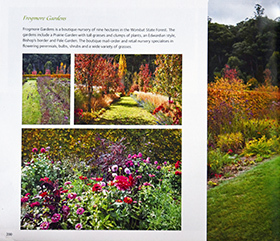 This book covers areas around Ballarat, Bendigo,Castlemaine, Daylesford, Macedon and Seymour. 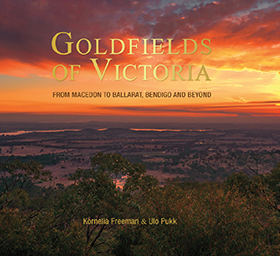 The discovery of gold near Ballarat in 1851 caused the Victorian gold rush and changed Australia forever.Discoveries at the Mount Alexander goldfields added to the rush. Prior to 1851, Australia was little more than a convict outpost for the British Empire, but the dream of striking it rich enticed hundreds of thousands of people from around the world to travel to Melbourne. 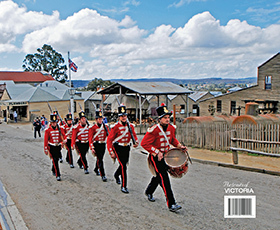 Sovereign Hill, a goldfield's town in Ballarat, capturesthe excitement of life in the 1850s, and attracts around450,000 visitors every year. Bendigo is home to the CentralDeborah Gold Mine and includes Australia's oldestworking pottery, which was established in 1858. The spatowns of Daylesford and Hepburn Springs offer mineralsprings and relaxing getaways. The elaborate, grand buildings of Ballarat and Bendigo aretestament to the affluence of the gold boom. Castlemaineand Clunes have retained their original buildings preservingthe magic of a previous era and attracting movie producersfrom around the globe. The experiences possible inthe Macedon Ranges and surrounding areas, with itsmagnificent gardens, mineral springs, majestic architecture,gold mines and quaint towns, are staggering.